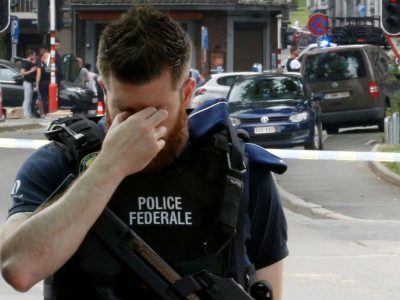 On May 30 2018, Benjamin Herman attacked two female police officers in Liège, Belgium, from behind with a box-cutter and then shot them with their own guns. In the immediate aftermath of the attack, it was not entirely clear what drove him to commit the crime. It took some time, but the picture is in place now and it is a familiar one. Herman had a long rap sheet of petty crimes and was in and out of prison for more than a decade. In 2012, he converted to Islam. According to some of his family members. it was a blessing at the time as he quit drinking and smoking. While in prison, he came into contact with Yassine Dibi and Fouad Benname, both serving sentences for criminal offenses. Dibi is a criminal who escaped from a Brussels courthouse in 2009 and kidnapped a prison director in 2010. Dibi was also a close friend and accomplice of Khalid el-Bakraoui, who blew himself up in the Brussels terrorist attacks in March 2016. Both Dibi and Benname are on the Belgian terrorism watch list. Dibi and Benname became devout believers in prison and started to organize prayers for prisoners. Dibi had been released from a strict regime and was in a more open wing of the prison in Marche-en-Famenne in eastern Belgium, giving him access to fellow inmates. This is where he met Herman and another convert. Just a few days before Herman carried out his attacks, the prison wrote an observation report about Dibi. The report stated that Dibi spoke often with Herman and another prisoner. Prison officials did not think this was alarming and Herman was granted 36 hours leave in late May. Herman had been granted leave before, without incident. This time was different. He killed four people altogether and wounded four more before being shot dead by the police. Shortly after the killing spree, Daesh claimed the attack, calling Herman Abu Bakr al-Belgiki. Although experts are not yet sure that Herman had given his allegiance to Daesh, he was in contact with known Belgian jihadis and radicals through social media. Herman’s crimes show that Western countries still have difficulty coping with radicalization. The potential threat of radicalization in the prison system has been an important focus for years, but no country has found the perfect solution. The Belgian authorities admit that there are around 450 prisoners who are radicalized in one way or another. In total, 237 extremist prisoners are registered in the “CelEx” (cell extremism) system of the Belgian prison system, spread across 28 prisons. Only two prisons have a special wing that separates extremists from other prisoners. At the center of the risk radar, 21 prisoners are considered especially dangerous hate preachers and recruiters for jihad. They are isolated in the special “Deradex” wings of the Hasselt and Itter prisons. Within the Belgian prison system, experts say that the terror threat posed by radicalized inmates has been at the maximum level of 5 for quite some time. These experts also state that isolating the 21 prisoners in the two designated terrorism wings does not really work. These prisoners only gain more stature among radicals, as they have been singled out. Herman is not the first man to become radicalized in a Belgian prison and turn to terrorism after release. Notably, he was preceded by brothers Ibrahim and Khalid El-Bakraoui, the suicide bombers of the Brussels attacks in March 2016, and Salah Abdeslam, a member of the cell that carried out the Paris attacks in November 2015. Abdeslam had bonded with others in prison and was able to hide after the Paris attacks and buy weapons thanks to a network that had formed while he was incarcerated. Other European prison systems have their own radicalization stories. In France, they include Cherif Kouachi, one of the Charlie Hebdo attackers in January 2015; Mehdi Nemouche, who attacked the Jewish Museum in Brussels in May 2014; and Mohamed Merah, who carried out the Toulouse attacks in March 2012. In Italy, Anis Amri was radicalized behind bars and went on to carry out the Berlin Christmas market attack in December 2016. Countries have different ideas about how to deal with radicalized prisoners. Some consign them to solitary confinement while others place them in deradicalization programs. In a few cases, prisoners have deradicalized because they accepted that they did something wrong and were in jail for the right reason. Then they used their time in prison to think things through and prepare to move on with their lives after release. However, for many criminals who come into contact with a recruiter in prison, the future looks different. Some who came under the influence of radical preachers and recruiters became so radicalized that that they went to Syria and Iraq to fight with Daesh after release. Some died and some showed their darkest side to humanity by decapitating prisoners or setting them on fire while still alive. In the case of the latter group, who have engaged in the worst kinds of human behavior, it is better that they never return to the civilized world.